The system is a fully automated machine, made up of three assembly and test modules. Specially coated bowl feed systems are used to feed very delicate parts into a rotary indexing feed system to allow them to be fully inspected and tested. Rejected parts are removed using a Compliance Assembly Robot Arm (Scara) Robot, whilst good parts are transferred to an assembly module for the remaining parts of the assembly to create the finished device. 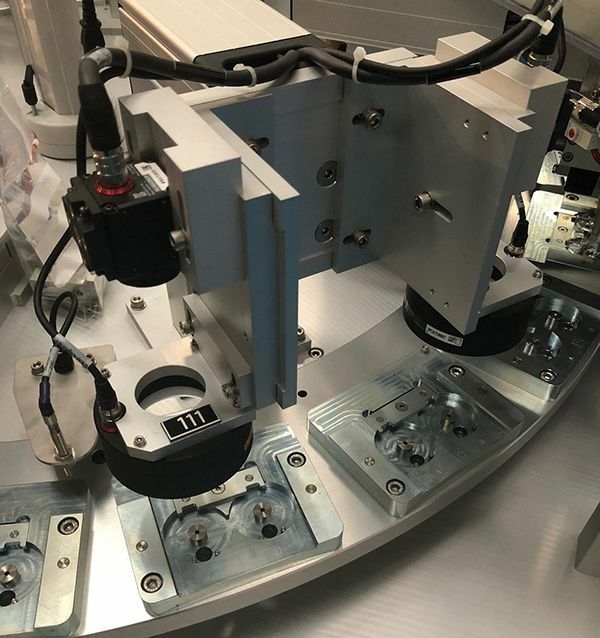 After a successful Factory Acceptance Test (FAT’s) and three weeks early, one of SP Technology’s automated solutions has been stripped down and ready for its journey to the south coast of England, to the home of a blue-chip medical device manufacturing facility. Engineers will follow for a full two weeks of commissioning, validation and training. The system is a fully automated machine, made up of three assembly and test modules. Specially coated bowl feed systems are used to feed very delicate parts into a rotary indexing feed system to allow them to be fully inspected and tested. Rejected parts are removed using a SCARA Robot, whilst good parts are transferred to an assembly module for the remaining parts of the assembly to create the finished device. The final process is then used to package the device, inkjet maker them with date and batch code information ready for final which is located outside of the cleanroom. At 70 finished packs per minute, the complete system has been designed to have 1.5 operators to run this complete line over 3 shifts. Not only will this increase production line efficiency, but it has a payback period of just 2 years.